We understand that shoe sizes across different brands may fit differently. Our sizes are based on the Brannock device, which is the metal measuring plate you can find in most shoe stores. We highly recommend getting your foot measured to get the most accurate size. We try our best to keep our sizing consistent. However, some of our styles may run smaller or larger than anticipated. To accommodate this, each product page includes "fit notes" from us, and from any customer who has left a review of the shoe. 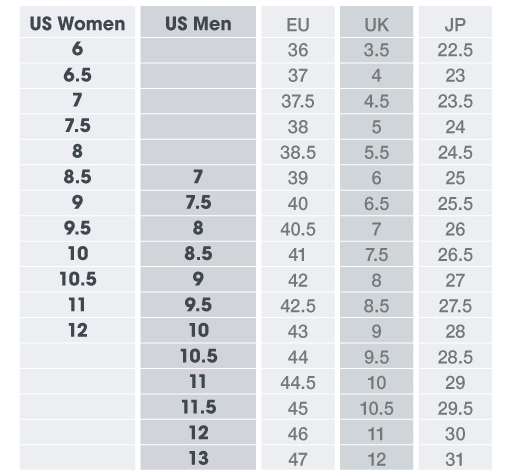 In order to help you select the best size, please view the following KURU shoe sizing chart. *Please note that this sizing chart is for reference purposes, including international sizing. For example, if you know what size you wear in UK, EU, or JP sizing, then you can use that to cross reference the size in KURU. Please note that all sizing on kurufootwear.com is US sizing. We hope this will help you choose the best size. If you still have questions after reviewing this chart, please contact a KURU Guru for additional help.